Cold Springs Morning Glow. Comb Ridge, Utah. 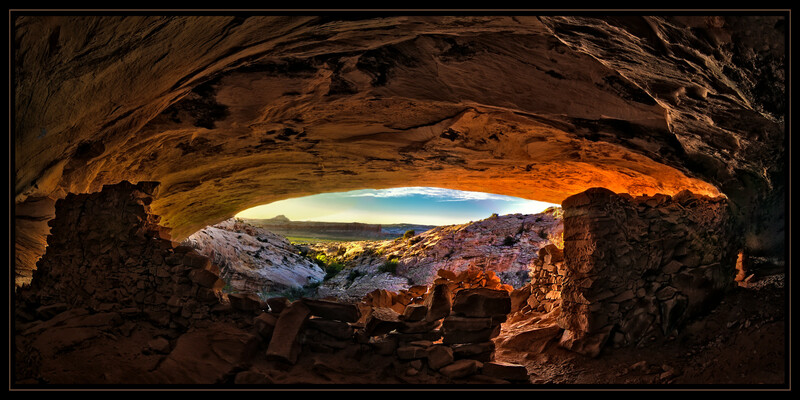 The living room of ancient Pueblo People of the American Southwest. Cold Springs Morning Glow. Comb Ridge, Utah. This is one of many caves with ruins along a 21 mile hogback (mountain with a series of rock formations exposed above ground) between Bluff and Blanding, Utah. We hiked up the canyon into the cave in time to take the photos for this image just as the sun came up, the only time the ceiling lights up with these colors. We were awed by the fact that we were in the living room of ancient Pueblo People.